Home » news » Three students at the University of Gadjah Mada produce gasoline from waste cooking oil. Three students at the University of Gadjah Mada produce gasoline from waste cooking oil. Indonesia is a producer and consumer of cooking oil that is high enough. As a consequence, Indonesia also has a problem with the high volume of used cooking oil. However, before long, which is usually discarded used oil it would have high economic value. Every year, cooking oil consumption in Indonesia is more than three million tons. Data Fields Indonesia Creative Traders Association (APKLI), which among other things oversees thousands of traders "fried" or fried snacks in the homeland mention, every trader in a day use between 3-5 liters of cooking oil. After use, usually used cooking oil or commonly called cooking, will be discarded. Some communities reworked into biodiesel for fuel purposes until the soap. Three students of Gadjah Mada University stepped forward again, by processing the used cooking oil into biogasolin or gasoline. They are Abdul Afif Almuflih and Khoir Eko testifying, a student of Chemistry, and Endri Geofani and the Faculty of Agriculture. In the local campus laboratory, the three demonstrate how to produce gasoline from waste cooking oil. According to Eko Khoir testifying, used cooking oils chosen to encourage people not wearing cooking oil repeatedly adverse effects on health. In addition, waste cooking oil are also available in abundance, especially among traders fried foods, snacks are very popular in Indonesia. Eko testifying added, the key is the catalyst of this change process, they created from clay, which is activated by metal Cadmium. Clay chosen because it is a material that can be found in almost all parts of Indonesia and inexpensive. "We use a catalyst derived from nature, and it stayed alone can dig it. 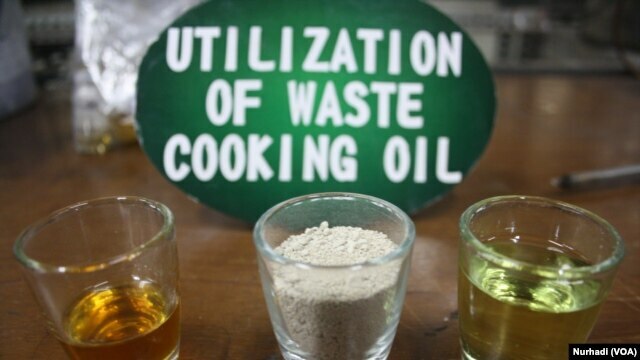 We use the waste as well, and does not have a high economic value that is used cooking oil. And also we design catalysts to be used repeatedly, because in practice today in most industries, the catalyst can only be used once, "said Eko Khoir testifying. Another research team member, Abdul Afif Almuflih said gasoline production process begins by heating the cooking oil. Steam heating will flow through the pipeline was completed, the catalyst was, and dripping in a tank as a new fuel. In the research that has been done since last year, from one liter of used cooking oil, will produce 420 ml and 290 ml diesel gasoline or diesel. Because this study has been able to produce gasoline made from used cooking oil, cooking oil use Afif believes will be more efficient in the production process of this biogasolin. Therefore, Indonesia as the second largest palm oil producer in the world, the opportunity to produce gasoline made from palm oil on an industrial scale. Despite claiming to have not calculated the cost of production in detail, the price of gasoline made from used cooking oil is believed to be no more expensive than existing gasoline. "We hope that this research is a first step, which will be pure palm oil can be used as raw materials and mass-produced for fuel oil (BBM). Moreover, Indonesia has the potential of oil palm is very abundant, especially in the western region, "said Abdul Afif Almuflih. This study at least has won four awards world. All four gold medals from the World Invention Intellectual Property Association (WIIPA), a gold medal from the Indonesian Invention and Innovation Promotion Association (INNOPA), bronze medals from the Malaysian Technology Expo (MTE) 2016 and a special award from the Toronto International Society of Innovation and Advanced Skills ( TISIAS) Canada. Title : Three students at the University of Gadjah Mada produce gasoline from waste cooking oil. 0 Response to "Three students at the University of Gadjah Mada produce gasoline from waste cooking oil."